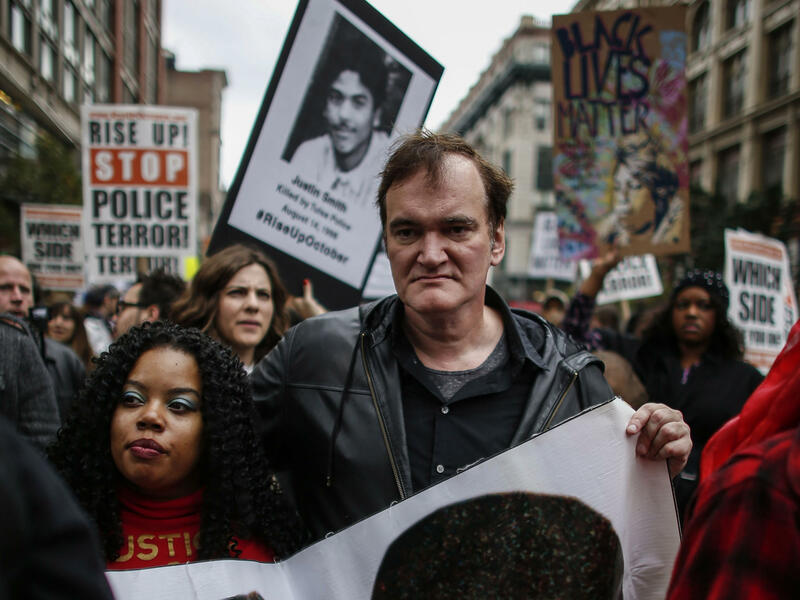 Director Quentin Tarantino attends a march to denounce police brutality in New York City on Oct. 24. At the rally, Tarantino said, "I have to call the murdered the murdered, and I have to call the murderers the murderers" — drawing considerable backlash from police unions. Police unions, furious with the remarks, have called for people to boycott Tarantino's upcoming movie. Tarantino, for his part, told the Los Angeles Times that he never meant all cops are murderers — just the officers involved in certain high-profile shootings. That explanation hasn't mollified the police unions. "Tarantino is a Hollywood figure, and he has a following," says Sgt. Jerretta Sandoz, vice president of the Los Angeles Police Protective League, one of the groups calling for a boycott of Tarantino and his movies. If the LAPD officers follow through on that call, it could become a real headache for the director. "Off-duty police officers are very important," she says. "There's motor officers, as well as patrol officers, that protect the film, protect the Oscars, direct traffic, provide security. Why would any police officer want to work with anyone who does not like police officers?" Carl Dix, one of the New York rally's organizers, compares this boycott threat to what he calls "a Mafia-style protection racket." "Only the pay that they want isn't in cash but in toeing a political line — that if Tarantino and people like him want to be able to operate, do their art, they cannot criticize police brutality," Dix says. There are shades of "Hanoi Jane" in all of this — with a Hollywood star becoming a symbol in a culture war. Only, instead of drumming up disagreements over the Vietnam War, as actress Jane Fonda's 1972 visit to North Vietnam did, the question here is whether American police are getting enough support — especially since the shooting in Ferguson. That question is starting to crop up in politics, where presidential candidates like New Jersey Gov. Chris Christie are raising the issue. "The No. 1 job of the president of the United States is to protect the safety and the security of the American people. This president has failed. And when I'm in the Oval Office, police officers will know that they have the support of the president of the United States," Christie said in the Republican presidential debate last week. "That's real moral authority that we need in the Oval Office." It's not clear that Christie is gaining traction with his "support the cops" message, but political science professor Jeanne Zaino says she expects Christie won't be the last to use it. "It seems to have found support amongst the Republican primary caucus-goers, and I think that we're gonna probably hear more rather than less of that." She sees some parallels between the police boycott of Tarantino and some of the recent tactics on the other side of the debate — for instance, when Black Lives Matter activists interrupted Hillary Clinton during a speech. Activists have criticized Clinton for not embracing their point of view closely enough. Zaino says there's an uncompromising tone that threatens to undermine the possibility of constructive political debate. "Both of these groups don't seem to be allowing for that type of cooperation. And yet if you get into a stance where it's a winner-take-all kind of thing, you could run into a problem of not getting any reform at all." And she says that kind of polarization could jeopardize America's recent moves toward bipartisan cooperation — rare bipartisan cooperation — on criminal justice reform. Quentin Tarantino is not apologizing. Yesterday, in an interview with the LA Times, the movie director did try to explain why he used the word murderers to describe shootings by police. That was at a rally in New York, and police unions reacted furiously. As NPR's Martin Kaste reports, this skirmish is the latest sign of how police reform is being politicized and polarized. MARTIN KASTE, BYLINE: In case you missed it, here's what Tarantino said at that rally against police brutality. QUENTIN TARANTINO: ...Because I am a human being with a conscience. And when I see murder, I cannot stand by. And I have to call the murdered the murdered, and I have to call the murderers the murderers. KASTE: In today's LA Times, Tarantino said he never meant that all cops were murderers, just the officers involved in certain high-profile deaths. But that explanation hasn't mollified the police unions. JERRETTA SANDOZ: Tarantino is a Hollywood figure, and he has a following. KASTE: Sergeant Jerretta Sandoz is vice president of the Los Angeles Police Protective League. It's one of the groups that have been calling for a boycott of Tarantino and his movies. And in LA, this kind of boycott could turn into a real headache given the importance of off-duty cops for the business of moviemaking. SANDOZ: Motor officers as well as patrol officers that protect the film, protect the outskirts, direct traffic, provide security - why would any police officer want to work with anyone who does not like police officers? KASTE: Carl Dix is one of the people who organized the New York rally where Tarantino spoke, and he compares this boycott threat - and these are his words now - to a mafia-style protection racket. CARL DIX: Only the payoff that they want isn't in cash but in toeing a political line, that if Tarantino and people like him want to be able to operate, do their art, they cannot criticize police brutality. KASTE: There's shades of Hanoi Jane in all this - a Hollywood star who becomes a symbol in a culture war. In this case, instead of Vietnam, the question is whether American police are getting enough support, especially since Ferguson. That theme is starting to crop up in politics. Here's governor and Republican presidential candidate Chris Christie in the debate on CNBC last week. CHRIS CHRISTIE: The No. 1 job of the president of the United States is to protect the safety and security of the American people. This president has failed, and when I'm in the oval office, police officers will know that they will have the support of the president of the United States. That's real moral authority that we need in the Oval Office. UNIDENTIFIED MODERATOR: Thank you, Governor. KASTE: It's not clear yet whether Christie's getting any traction with this support-the-cops message, but political science professor Jeanne Zaino says she expects Christie won't be the last one to use it. JEANNE ZAINO: It seems to have found support amongst Republican primary caucus-goers, and I think that we're going to probably hear more rather than less of that. KASTE: And she sees a parallel between the police boycott of Tarantino and some of the recent tactics on the other side of this debate - for instance, when Black Lives Matter activists interrupted Hillary Clinton during a speech. Activists have criticized her in the past for not embracing their point of view closely enough. Zaino says there's an uncompromising tone here which threatens to undermine the possibility of constructive political debate. ZAINO: Both of these groups don't seem to be allowing for that type of cooperation. And you know, if you get into a stance where it's a winner-take-all kind of thing, you could run into a problem of not getting any reform at all. KASTE: And she says this kind of polarization could jeopardize America's recent moves toward bipartisan cooperation, rare bipartisan cooperation on criminal justice reform. Martin Kaste, NPR News. Transcript provided by NPR, Copyright NPR.